When you look at the 2017 Acura NSX, it’s understandable if the first thing to catch your eye isn’t the door lock. From its swooping lines and arches to its massive engine framed in the rear window, there’s a lot to look at that you don’t see every day (unless, of course, you work at Butler Acura.) Yet the lock, visible on the NSX’s door handle, speaks volumes about both the NSX and Acura as a company. Supercars – vehicles designed to dominate racetracks and turn heads in high-end driveways – hide their door locks. The concealed lock has become such an industry standard on high-end cars that even lower-level performance cars make a point of hiding the key cylinder. So if a $50,000 Cadillac doesn’t feature a visible keyhole, why does a $200,000 NSX? In an Acura, even one designed to beat a Lamborghini in a straight line, function is more important than form. All the curves and vents on the NSX play a real purpose in its aerodynamics and cooling. Its brakes, its engine, and its carbon fiber components all are built and located the way they are to improve the car’s performance. And its door lock is exposed so that the car is accessible if something happens to the internal battery, because the NSX is not a car to be looked at; the NSX is a car to be driven. 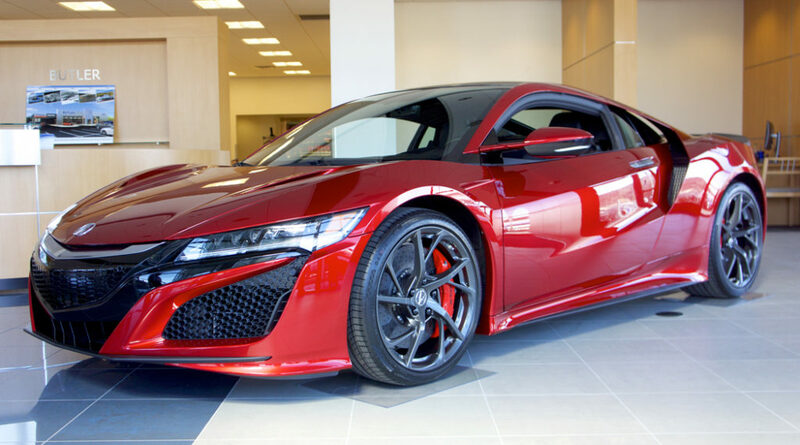 At a time when rival manufacturers are building cars that won’t even let the owner access the engine bay, Acura has designed a supercar whose owners won’t have to worry about messing with ornate trim to open their door, because while the NSX is certainly well worth appreciating from the outside, it was designed to be experienced from the driver’s seat.